Chin State, remote and mountainous and one of the poorest regions in Myanmar, was among the hardest-hit by floods in 2015. Asia and the Pacific, the most disaster-prone region of the world, has been struck by 1,625 disasters during the last 10 years amounting to over 40 per cent of the global total, thereby calling for a collective political commitment from the regions' leaders to mitigate risks posed by disasters, according to a new United Nations report. The 2015 Asia-Pacific Disaster Report - 'Disasters without borders: regional resilience for sustainable development', compiled by the UN Economic and Social Commission for Asia and the Pacific (ESCAP) also found that nearly 1.4 billion people from the region have been affected by these natural disasters, constituting 80 per cent of those affected globally. “It is a grave concern that disasters are becoming more frequent, much larger and more intense. As the report highlights, the majority of the disasters in our region are cross-border in nature. This is clearly demonstrated by the earthquake that struck the Alpine-Himalayan belt yesterday, affecting Afghanistan, Pakistan parts of India and Tajikistan,” said Ms. Shamshad Akhtar, Executive Secretary of ESCAP in a press release. The report presents a framework for integrating disaster risk reduction into sustainable development plans, policies, sectoral programs and budgets. 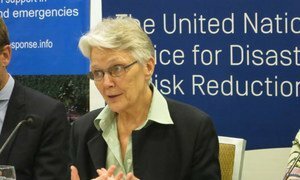 It further observes that even as every sector can be affected by earthquakes, floods or cyclones, it is important that they consider how to make itself disaster resilient. According to the report, Asia and the Pacific have incurred substantial economic damage for more than half a trillion dollars over the past decade, which accounts to nearly half the global total. Additionally, the report clarifies that the figures indicated are “gross underestimates” as there are no standardised methodology for collecting disaster statistics, which may result in many unreported disasters. The report also found that the region's existing risks are exacerbated and new risks are created, by rapid economic growth, rising population, burgeoning cities, and the subsequent impact these interrelated processes have on environmental buffers. Further, the report points out those regions that work together by sharing technology, information and expertise for disaster preparedness have been far more successful in tackling disaster risks. It also identified the areas that lack strong cooperation, especially cross-border floods and landslides. “Only by coming together in the spirit of cooperation can the Asia-Pacific region hope to become truly disaster resilient,” said Ms. Akhtar. Although investing in disaster risk reduction is proved to be cost effective, the report observed that neglecting disaster management of risks such as drought could put people, cities, infrastructure and economies at risk. The report notes that impact from such neglected or “forgotten disasters”, which pushes vast number of people into debt, poverty and, sometimes suicide, can be diminished if it is treated as a long-term recurring risk. Additionally, the report highlights the importance of multi-hazard early warning systems and maps out the way to provide right information to right people at the right time. "A fundamental rethink is needed as many governments still follow a short-sighted approach to disasters- with the focus on response, and paying less attention to adaptation, mitigation and preparedness,” said Ms. Akhtar. The report will be launched today at the ESCAP Committee on Disaster Risk Reduction which will be held between 27th to 29th October in Bangkok. Senior policy makers from across Asia and the Pacific will discuss how to build regional resilience in the context of newly agreed sustainable development goals. Amid growing fears that the irregular climatic activities of El Niño will result in severe weather events across the hazard-prone region of small islands and atolls in the Pacific, the UN Office for Disaster Risk Reduction (UNISDR) today addressed a gathering in Suva, Fiji, of disaster reduction and humanitarian response partners from across the region at a joint programme of events around regional resilience to disasters and emergency management.